CCR Refinery, a Glencore company and industry leader in copper refining and precious metals processing, had a problem. As part of the copper refining process, copper anodes are immersed in a 15% sulfuric acid solution. Through an electrolytic process, 99.9% pure copper cathodes are created. 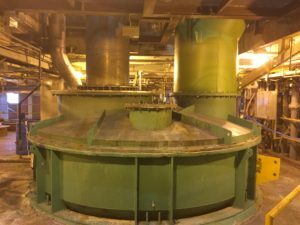 This process also leaves behind a waste solution with valuable metals, and so a second process is engaged to reclaim those metals. This waste solution is moved to an Evaporator unit. In the Evaporator, hot air is pumped into the solution. This raises the strength of the sulfuric acid solution to 70% and causes nickel sulfate to precipitate out of solution. The chemical reaction also creates a highly corrosive steam at 300°F that needs to be vented. And here’s where the problem occurs. The lining of the elbow pipe that vented this sulfuric acid steam could not long survive the acid mist’s corrosive effects. Also, the high temperatures, extreme temperature fluctuations, and vacuum pressures all contributed to the creation of cracks, pinholes, and leaks in the lining of the pipe as well. This meant that CCR had to shut down one of these two production lines every 2 to 3 months to repair the PFA lining. The repair costs as well as lost productivity were a growing problem. CCR had it in mind to try an exotic metal alloy tank but, while it could handle the temperatures and did not use a liner, it would not handle the corrosive effects of the sulfuric acid steam. CCR even considered converting back to antiquated lead and brick-lined equipment, but they couldn’t solve the weight-bearing needs of the elbow. So, Mario Dalcourt, one of CCR’s maintenance mechanical engineers, and his team reached out to the European maker of the Evaporator to ask what they might suggest to combat the issue. Fortunately, they had deployed a new PFA technology that had been working very well. Once CCR understood the capabilities of this new PFA lining approach, they knew a cost-effective solution was at hand. Now CCR just needed to find a company knowledgeable in this new PFA technique who was closer to their facility in Montreal. 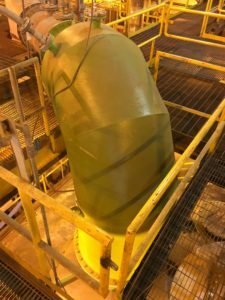 After a bit of internet research, they connected with Pennsylvania-based Electro Chemical, a world leader in the fabrication, welding, and installation of fluoropolymer linings. After a plant visit to Electro Chemical (EC) and a series of in-depth conversations with their experienced PFA lining specialists, Mario and his team knew that Electro Chemical had the technical knowledge, plastic welding know-how, and installation experience CCR was looking for in their new provider. 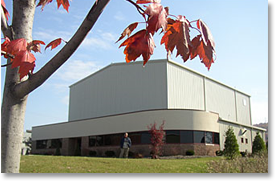 Electro Chemical also had one more big “plus” – they had a new high-temp epoxy they created in tandem with a major US engineering university. This new adhesive combined the high-temp tolerance of an epoxy with the elasticity of an elastomeric adhesive. EC’s new proprietary adhesivecould tolerate temperatures up to 360° F without becoming brittle and cracking. CCR gave Electro Chemical the contract to re-line their elbow pipe. In November 2016, the new pipe came on line. And after one year of operation, CCR has not had to do any maintenance to it! The CCR team is thrilled with the performance of the new PFA lining. Not having to shut down for service 4 to 6 times a year has meant notable savings in repair costs as well as a boost in productivity. The team at CCR believes their elbow pipe will keep going for quite some time. 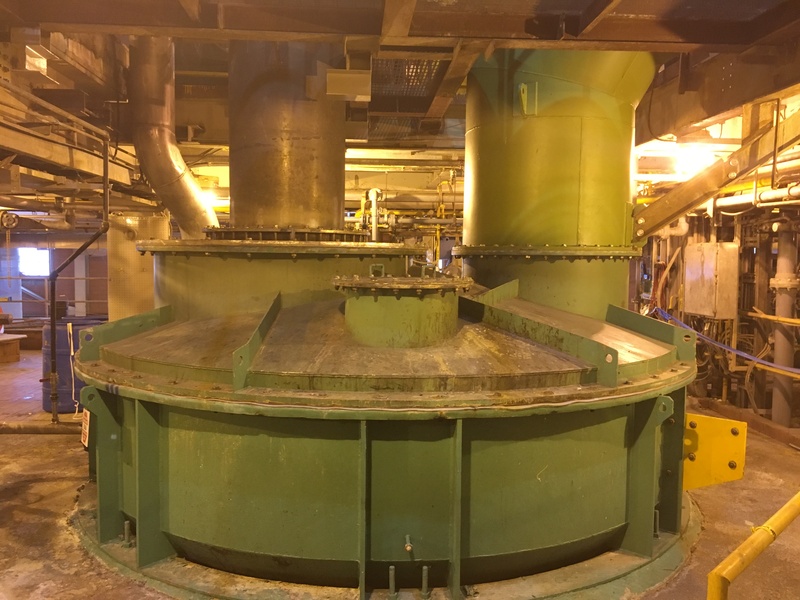 And not only are they saving on repairs and downtime, their new PFA lining has also reduced their concerns about any potential environmental exposure in the workplace as well. contact Mike Amant at either 610-965-9061 or mamant@electrochemical.net.